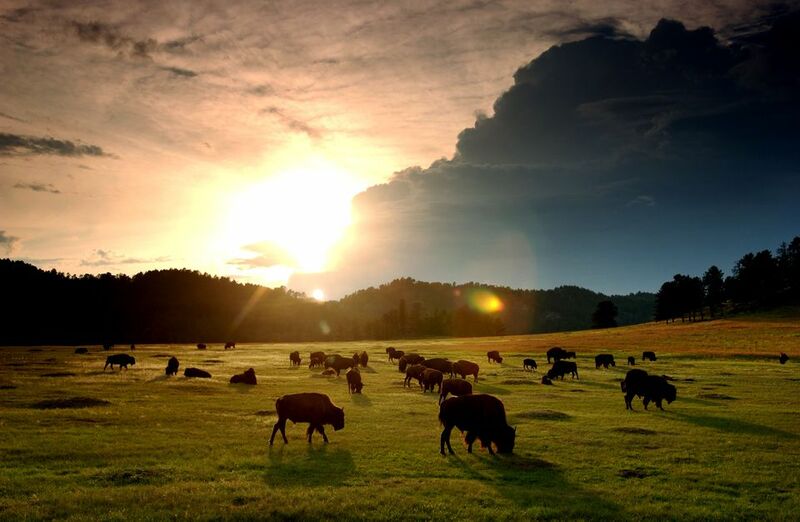 The Black Hills and the Badlands are several hours apart in western South Dakota, but many travelers visit both as they head westward on I-90 in the direction of Yellowstone National Park. Budget travelers should take time to appreciate both South Dakota attractions before moving on. Mount Rushmore serves as the most recognized landmark in this region, but there is much to see beyond this man-made attraction. The rock formations of Custer State Park shelter mountain goats and human climbers from around the world. Badlands National Park is home to some of the most distinctive land formations you'll see anywhere. Although summers are busy here, most of these features can be enjoyed without the crush of tourists you'll see in national parks further west. The iconic symbol of the Black Hills and perhaps the entire state of South Dakota is Mount Rushmore National Memorial. There is a modest parking fee, which is cut in half if you're at least 62 years of age. The passes are good for 24 hours after purchase. Technically, the site is free to visit, and the fee goes for parking. This means you will not be able to use a National Parks Pass for free entry. From May to September, there is a nightly lighting ceremony. Bleacher seating is available for this presentation, which is free of charge. Keep in mind that traffic could be congested after the ceremony. To avoid crowds, the best time to visit the memorial is when the area opens each morning. Grounds open at 5 a.m., and the visitor center at 8 a.m. Spend time in the visitor center to get a better idea of the history and politics involved in creating this landmark. Another attraction that brings visitors to the Black Hills is the annual Sturgis Motorcycle Rally in early August. Up to half-a-million enthusiasts descend on the small town and nearby communities. It's not the best time to find lodging in Sturgis, and what is available is likely to be high-priced. Jewel Cave National Monument, near Custer, S.D., is a favorite choice of spelunkers and others who want to become familiar with the fascinating world of caves. Here, you'll find about 180 miles of underground passages. Several tours are available at a cost of $12, but be aware that in the summer months, spots can fill up quickly. Possible dining, accommodation, and entertainment discounts are available through a booklet called The Black Hills Coupon Book. The cost is $20, and promoters say it provides $2,500 in potential savings. Naturally, you'll never achieve anywhere near that level of benefit. Take a look at the offerings and decide if you'll get at least twice the purchase fee back in savings. BlackHillsVacations.com is an online travel agency specializing in the area. They might save you money on bookings, but it's also possible you can do better on your own. Their offerings are worth a look as you plan your visit. The Custer State Park entrance is just outside the town bearing that same name. By state park standards, the entry fees are quite expensive: $20 per car and $10 per motorcycle. An annual pass good for all South Dakota parks is $30. Although the entry fee is high, it's fair to say this is one of the premier state parks in the nation. It would be easy to spend several days here and still not cover all the attractions. Pay the entry fee gladly and know it represents a solid value. Driving through the park, it's possible you'll encounter a stray buffalo. If so, come to a complete stop and wait. Although a curiosity, they can be dangerous if provoked. The visitor center offers a movie presentation explaining the buffalo habitat and other aspects of the park. Three scenic drives, varying in distance from 14-18 miles each, provide opportunities to observe other park residents, such as mountain goats, bighorn sheep, and perhaps even a mountain lion. But on a clear day, you'll also enjoy some memorable views. Plan on spending at least a day in the park. Badlands National Park is quite distant from the Black Hills, but many budget travelers combine a visit to the park with time in the mountains. The western (Pinnacles) entrance is located south of Wall, S.D., about 56 mi. east of Rapid City. The scenic drive through the park runs for about 25 mi., so the eastern edge is at least an hour from the Black Hills. Keep in mind that Rapid City lies on the eastern edge of the Black Hills region. Entry fees to the park are $20 per car, with a rate hike to $25 scheduled for 2019. It's possible to see the park in a half day, but you're likely to want to spend more time observing the unique landforms and the wildlife. You'll love watching the prairie dogs play, but watch out for rattlesnakes. The Ben Reifel Visitor Center offers exhibits to aid understanding of how these "badlands" came to exist. The best budget hotel options are in Rapid City, the region's largest urban area, and South Dakota's second-largest city. If you want a more convenient location in the smaller towns of the Black Hills, you'll pay for the privilege, especially during peak summer months. The parks offer prime RV and campsites. Camping at Custer State Park is possible at 13 scenic camping areas. Cabins can also be rented. Badlands National Park campsites are available at $22/night, or $37/night with an electric hook-up. In all, 96 level sites are available, most with scenic views. Be certain that you reserve campsites and RV parking well in advance of your summer visit. Reservations are not a bad idea at other times of year as well. Outdoor adventures in this region abound, with a great selection at prices generally more reasonable than one would expect in a resort area. Hikers, for example, will find about 450 miles of trails on 75 marked routes. Rock climbers find plenty of opportunities within designated areas of Custer State Park. Golf and water sports are also available in the area, so plan carefully to find the best options for your skill level and budget. Wildlife is perhaps the best free attraction in the region. Bighorn sheep lazily graze on prairie grass and block traffic on rural roads. It's fun to watch mountain goats summit steep pinnacles of rock, or elk herds roam across the flatlands. The parks offer great wildlife talks, led by experts who have studied the behavior patterns of the native species. Find a schedule of these talks and plan to take advantage of what can be a memorable experience—sometimes within earshot of the buffalo herds. In Spearfish, the D.C. Booth Historic Natural Fish Hatchery and Spearfish City Park, Spearfish can make a fun stopover for children, who can purchase small bags of food and feed the fish. The South Dakota School of Mines offers a nice geology museum with free admission. The fossil displays and "Kids Zone" can add entertainment on a vacation day during which you've already paid for several admissions. Near the entrance to Badlands National Park, you can visit Wall Drug in the town of Wall. It started as a sleepy drug store during the depression years, but the owner wanted to pull in business from the tourist traffic. So he offered free ice water and put up signs for miles in each direction. From that humble beginning, the place has morphed into what many would call a tourist trap. But it's an amusing pit stop, and yes, they still dispense free ice water. Today, Wall Drug directional signs are displayed as far away as Europe. Would You Stay in a Capsule to Save Money?